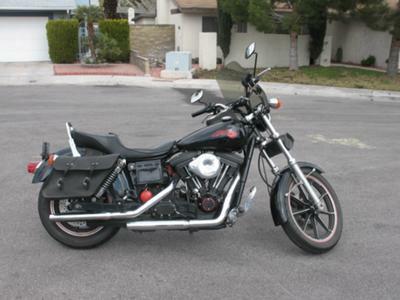 I have a 1991 Harley Davidson Sturgis 50th Anniversary Model Collectors Edition Harley Davidson for sale that has had minor Modifications like a Cam, S&S Supper "E", Windshield, Saddle Bags, New Exhaust, Corbin Custom motorcycle Seat, extra Sissy Bar and a tool Bag. The 1991 Harley Davidson Sturgis was #56 of 1157 manufactured and is the perfect bike that will take you to Sturgis in style. Everybody will notice when you roll in on this pampered numbered, collectable Harley that looks almost new. All of the original, stock parts go with the bike. The used motorcycle is located in Las Vegas, Nevada and my asking price is a very cheap $10,500 (or you may make a reasonable offer). If you are interested you may leave your questions and contact information in the space below provided by Strike Lightning for listing Used Motorcycles for Sale and the owner will return your call as soon as possible. Strike Lightning would also encourage bikers to submit a review of the 1991 Harley Davidson Sturgis 50th Anniversary Model to help potential buyers make informed decisions and to benefit the biker community as a whole.